Check out EWTN on Sunday, July 9, and Monday, July 10, for two 30-minute shows about St. John Neumann, Redemptorist priest and bishop. Both are episodes in the series Catholic Beginnings: Philadelphia, hosted by Father Charles Connor. At 6:30 p.m. Eastern on Sunday, July 9, the focus is on St. John Neumann as bishop of Philadelphia from 1852 until his death in 1860. At the same time the following day, the show will coverBishop Neumann’s role in finishing the Cathedral of Sts. Peter and Paul, begun in 1846 under Bishop Francis Kenrick. For further details, visit http://www.ewtn.com/tv/index.asp. 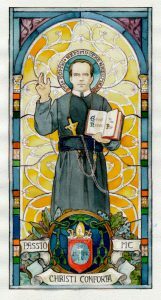 Read more about St. John Neumann here.